KO Performance understands that the owners of BMWs care as much about the aesthetics of their vehicles as they do about their car's performance. Whether you are going for Bling, or OEM BMW parts and BMW accessories to make your vehicle stand out from the crowd, KO has you covered. From BMW M3 CSL OEM parts like the coveted CSL trunk lids and diffusors, to AC Schnitzer, Hamann, MA Shaw, and the BMW Individual Program offering unique OEM BMW parts and quality. KO Performance has gone to great lengths to obtain OEM CSL parts direct from Germany and import them into the USA. This is the hottest part in the E46 M3 BMW parts market! 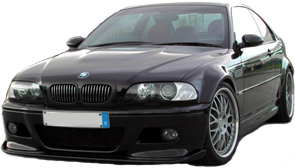 KO Performance is your source for these extremely difficult to obtain, limited quantity OEM CSL BMW parts like the CSL Front Fascia, which is not offered by BMW in the USA. Only 1-2 of each piece are generally available. Order yours today! These are not sold by BMW in the USA! Bare-Bones Kit includes 4 BMW angel eye halos, or rings, 2 inverters, and other hardware. Availble for E36 3 series, other products available for E46.